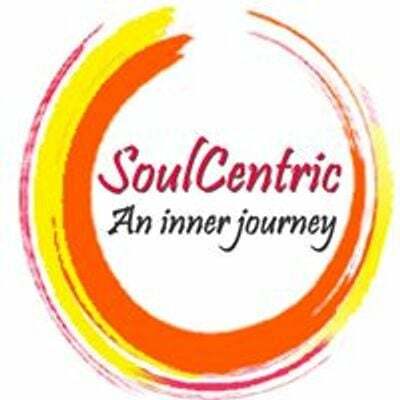 This session will guide you on an inner journey with the soft and soothing sounds of the Sitar. 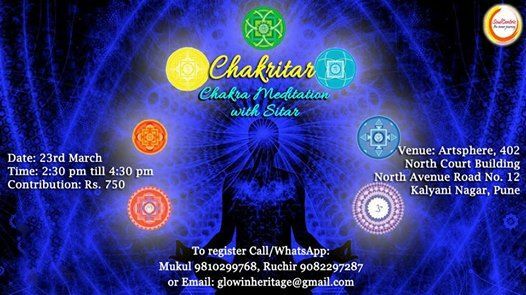 The session starts with a short theory on the Chakra and music system followed by experiencing the Sitar and use the music as a torchlight to explore the depths and breadths of our inner Self. The stress will be more on the experience rather than the theory. 3. Tanpura session: It will begin with a silent, no-sound meditation and the gradual start of the Tanpura to create the Naad which are positive sound vibrations. The Tanpura is an instrument which has 4 or 5 strings and these are tuned in a particular sequence of pitches or notes. (Pa Ni Sa Sa Sa). The tuning is done in the middle octave. The concept of using the Tanpura is that of creating a “void” or empty space. Just as white is actually not a color but the absence of all the VIBGYOR colors, so also the sound of the Tanpura when heard as a whole, creates its universal colorless color. This color in music gives birth to a void, which is to be filled later by one’s own journey as the session progresses. The absence of any lyrics in the entire session keeps the focus on going inwards and connecting with the cosmos. The feeling is that of slow and gradual renunciation of one’s identity and surrendering to one’s Soul. The sound of the Tanpura puts the mind into instant meditation. 4. Sitar session: The Tanpura will slowly go into the background and the Sitar will fill in as the foreground. The Tanpura now indicates a basic level of awareness and is synonymous to the breathing and all the involuntary functions of the body. The rendition with the Sitar starts with a specific Raga. The Raga chosen for this session is Raag Gavati. This Raag belongs to the Kafi thaat and is aimed at activating the Solar plexus or the Manipura chakra. Raga Kafi helps to to stimulate energy, willpower, change in attitude and improves digestive system . It helps in giving up vices and impulsive habits. 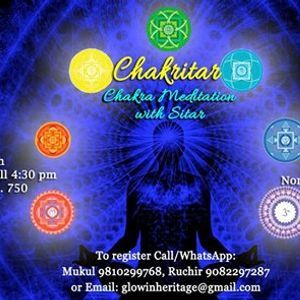 This Chakra when not activated leads to poor digestive system, pancreas, liver and kidney problems. 5. Feedback: The session concludes with a feedback and discussion in which the audience shares their own experiences during the session. Nikhil Patwardhan has over 30 years’ experience with Indian Classical music and the Sitar. Nikhil started his Hindustani Classical music training at the age of five with his grandmother, Smt Sarojinidevi Patwardhan and father, Shri Kumar Patwardhan. At the age of fifteen, he started receiving training from his Guruji Pandit Parthapratim Chatterjee, belonging to the Maihar Gharana. He has performed at multiple venues nationally and internationally including the US, UK, Japan, Dubai, Indonesia among others. He also teaches Sitar and conducts music therapy sessions with the Sitar.